February 15, 2003 marks the tenth anniversary of the largest protest in human history. As the war clouds gathered over Iraq, millions responded globally to a call for demonstrations against the impending war. The average of all estimates places about 18 million people in the streets of approximately 800 cities around the world. The event spanned all the continents including Antarctica where some 50 scientists joined to form the universal symbol for peace. The feelings of Winnipeggers were also expressed on that day. 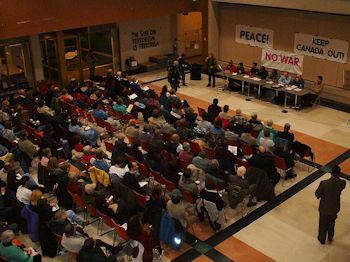 Thousands came out in the largest anti-war demonstration since the first Walk for Peace in 1982. The day was unprecedented not only in terms of the size of the protests but also in the international coordination of the event. This action would have not been possible but for the ground work laid in previous years to link social movements globally on a wide range of issues. February 15, 2003 showed that social movements were truly capable of global action on a scale that would shock governments and politicians, and force them to reconsider their actions. Patrick Tyler writing in the New York Times observed that the massive upsurge of anti-war sentiment “fractured the Western alliance” needed by the U.S. to share the economic and military burden of the war 1. There is good reason to believe that continued opposition from Canadians beyond their large participation on February 15, 2003 led to Prime Minister Chretien’s decision to keep Canada out of the U.S. war against Iraq. However, in marking this anniversary there is another aspect to consider. It is said that “what’s past is prologue.” This is true in measuring the dangerous developments of today. The U.S. led “war on terror” began in Afghanistan on October 7, 2001 when Operation Enduring Freedom was launched by the armed forces of the United States, Australia, Great Britain and France in conjunction with various Afghan war-lords. Canada was eventually to be become a full partner in that war. More recently it was Libya, and today it is intervention in Mali. Today’s imperative is to change this course. The global movement that expressed itself on February 15, 2003 showed where the sentiments of people lie. They rejected the notion that the U.S. or any major powers could set a course for war and that people had no choice but to follow. Canadians never accepted the war in Afghanistan as “their” war or as a “necessary” war. It is similar with the Canadian military action in Libya and now Mali. Therefore, the need is for Canada to regain its independence in foreign and military policy. That will necessitate a fundamental shift in Canada’s alliances. It will also necessitate a new political will amongst Canadians to make this so, but perhaps the seeds for this have been sown by movements such as Idle No More. Glenn Michalchuk is Chair of the Peace Alliance Winnipeg. 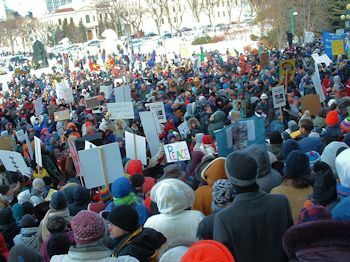 Peace Alliance Winnipeg (www.peacealliancewinnipeg.ca) is a city wide organization devoted to peace and social justice.